Once again, Sharp is at the top of the display mountain. 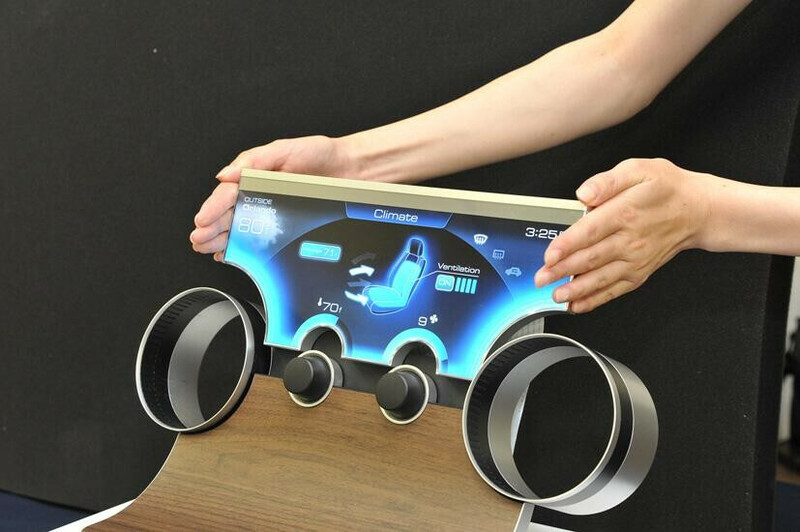 The company, lately known for its energy-efficient IGZO display panels, announced Free-Form Display. Thanks to the aforementioned IGZO tech and proprietary circuit designs, Sharp's creation gives engineers and designers unparalleled freedom in coming up with the device's form. While common smartphone displays are rectangular and must accommodate a drive circuit in their bezels, the Free-Form LCD Display is mostly free of such constraints, as its gate driver is dispersed through the pixels on the display matrix. The bezel can be minimized to borderline non-existence, and designers can twist it to whatever shape they want. The FF Display isn't for mobile devices only. Sharp's concepts include a single panel on a car dashboard, elliptical screens for wearables, and large monitors with shapes that make them more immersive. Hopefully, this will pave the way for more interesting and daring smartphone designs. It's not known when these displays will be heading to production, but Sharp promised to put them on the market as early as possible. Now, this is what they call innovation! Except this is new exactly HOW? Tell me where have you seen this before? Actually the Motorola Aura have a non rectangular screen back in 2008. And it's amazing! How did they 'disperse' it among the pixels? Something fan-shaped for easy one-handed (thumb) handling. exert some effort. you'll realize that with this, the whole front panel can be turned into the display itself with some punctured or cut out parts to accommodate the camera, proximity sensor, and speaker holes. add local dimming to the mix and you can have a display that acts like amoled. the center portion is dedicated for the android UI while the parts to the sides can be used for notifications or for the on-screen buttons. no need for the stupid YOUM concept that samsung can't find good use with. What I meant was, everyone is so used to rectangular smartphone that when a differently shaped phone comes out, i.e. circle, oval, fan^ hexagon, whatever the shape may be, it will look plain weird and silly since we're so used to a rectangle. Sorry, should have put more effort into dumbing it down a notch. If you look at smartphone use of this tech, it might not be for alternative shapes. But it might mean bezelless smartphones for instance. I don't think that the phone necessarily will not be a rectangle shape overall, but there are areas to innovate within the current norms as well. A phone company could cut out around the physical home button and have the screen go end to end, or say that they rounded the corners of the phone to such an extent that the screen area was also rounded off... The bigger problem for smartphones is to figure out what to do with the extra screen, because in both of these situations it will not increase the usable 'real-estate' for say watching a movie, so they will have to find something that makes sense to a consumer.... not just add something to be different. This if fantastic, I see this in cars & advertising displays. Combine this with flexible screen tech and they can have endless possibilities.